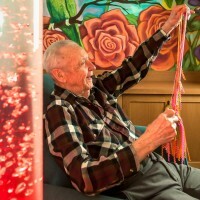 Our Founder, Wendell White, has said many times that if we are going to do dementia care, then it is going to be, from design to care philosophy, something extraordinary. 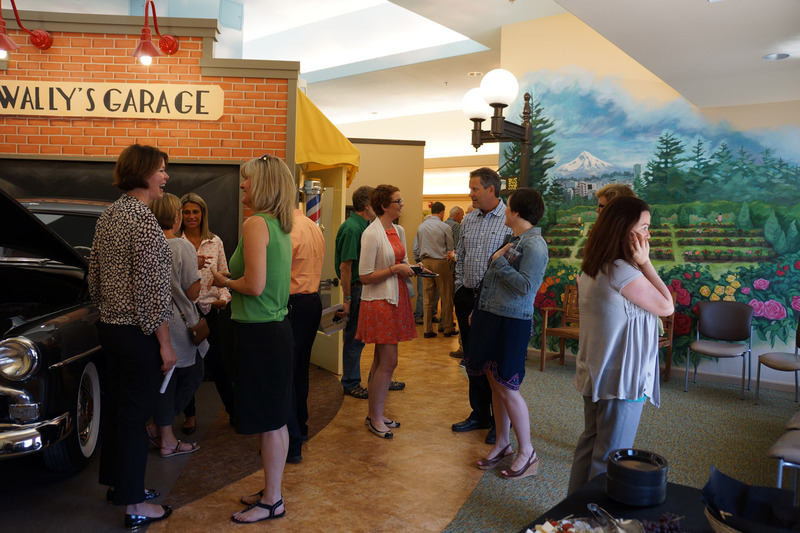 This was the directive of our architectural team that drew up plans, our construction branch that executed the vision, and our design team that outfitted our Parkview communities – designing for memory care to successfully realize the extraordinary. No one wishes for a progressive decline in memory, thinking, behavior, and reasoning skills that disrupt our ability to function independently. 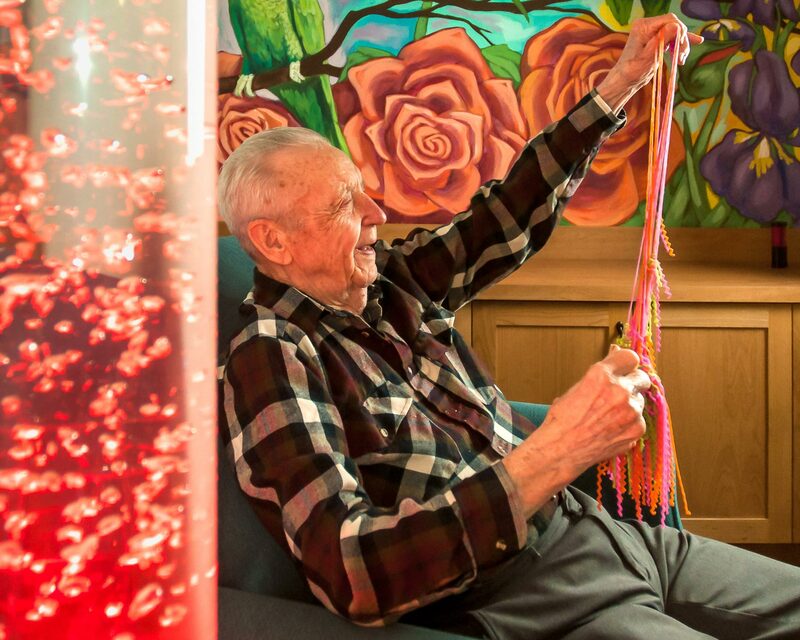 But in a world where this is a reality for so many, we have designed a state-of-the-art memory care community to support individuals with dementia to their best wellness, faculty, and comfort. 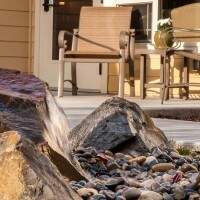 We are proud to share with you here an introduction to Parkview design. 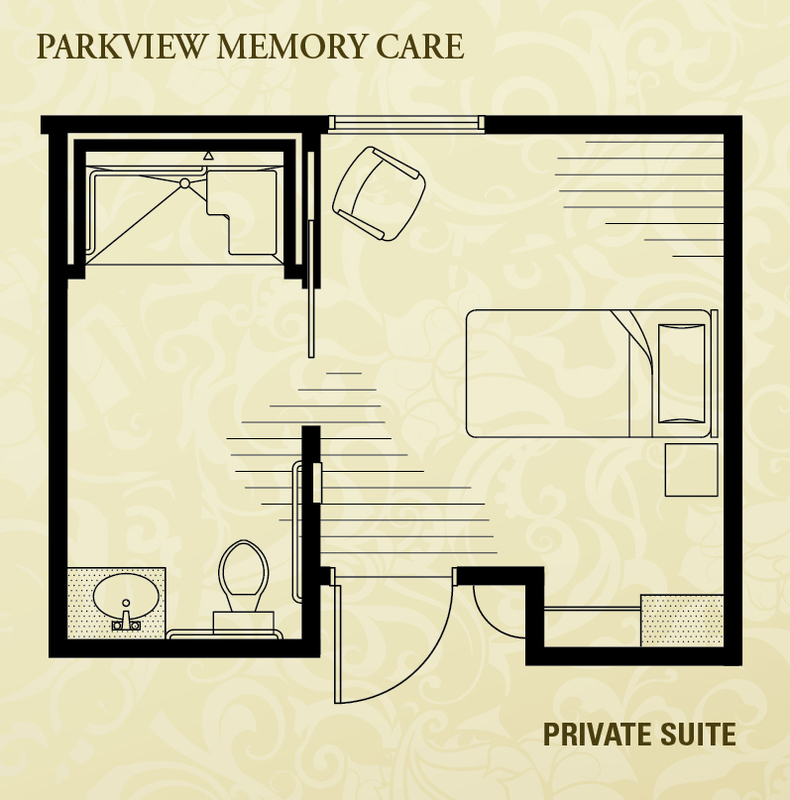 As you arrive at Parkview you enter our warm reception area around which our nursing station and offices are situated, but once through our secured door you have entered into the world of the Parkview Neighborhood – our residents’ home. 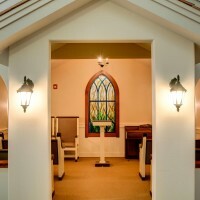 Touring along our circling Great Room’s indoor path you will pass our beautifully appointed chapel with sparkling stained glass window and organ or piano at the ready, skirt the popped-open hood of our polished antique car, peak in on our beautician at the salon shop front, get drawn into the sights and sounds of our Snoezelen Therapy Room’s moving sensory images, colors, textures, and objects, and happily find an open seat at our theater’s current show. 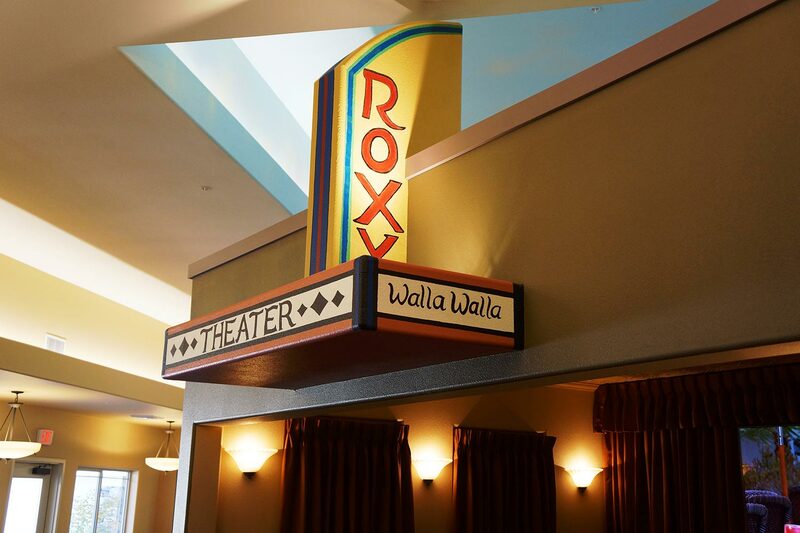 As you round back, you will be met with our dining nook and temptations of the culinary team. 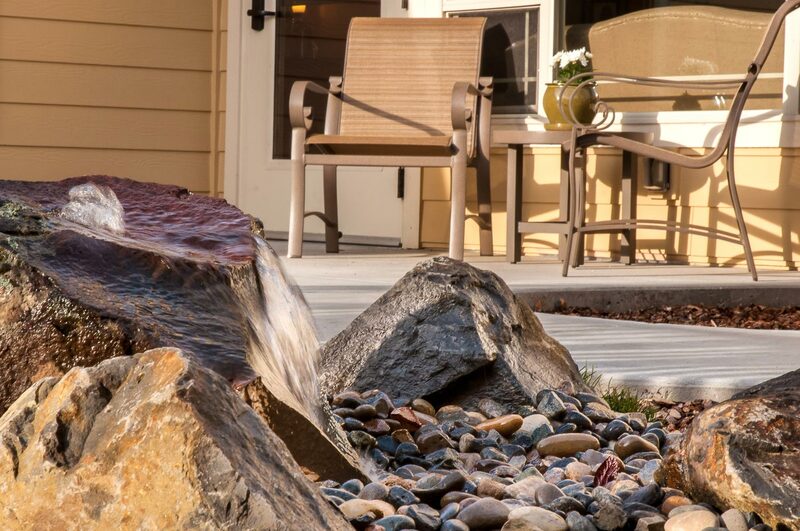 Designed to be pleasant and inviting, this area is all about engagement, color, purpose, and activity for our residents. Moving further in you will notice outdoor atriums on either side of the Great Room. 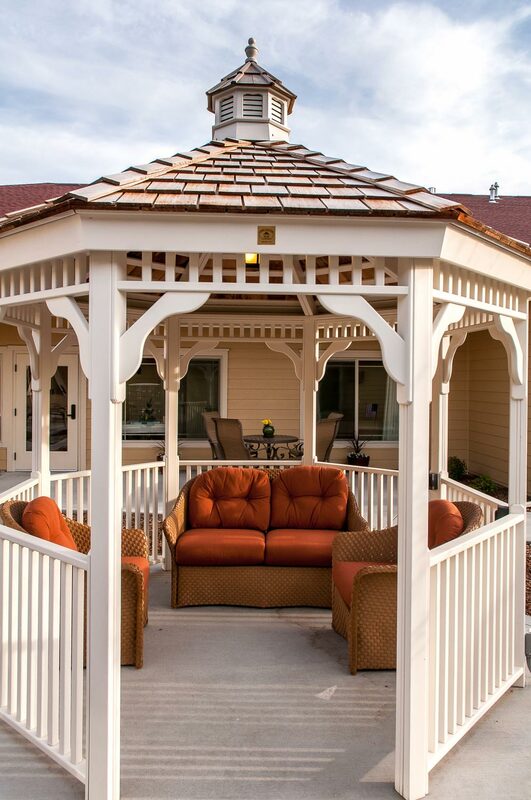 Providing countless windows for warm natural light, these outdoor courtyard areas draw our residents to sunshine, water features, our green house, and cushioned gazebos. 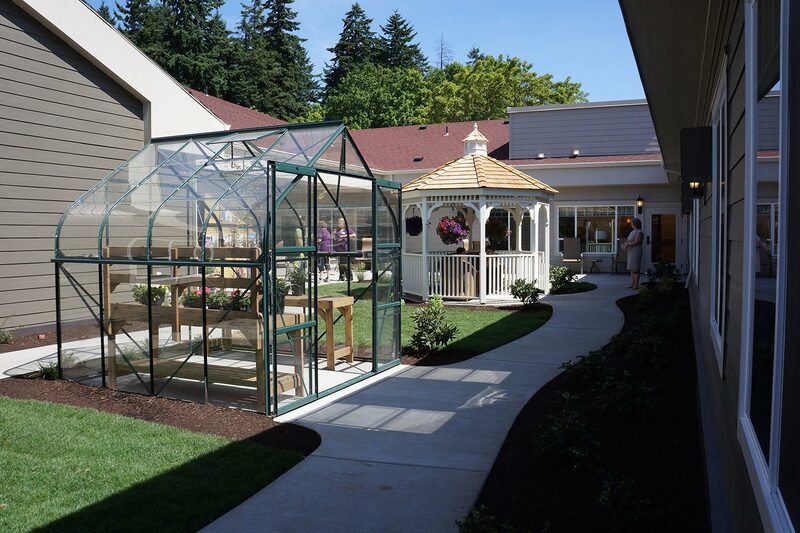 Our atriums are designed to provide safe and secured areas for enjoying all the benefits of outdoor elements so crucial to people with Alzheimer’s and other forms of dementia. 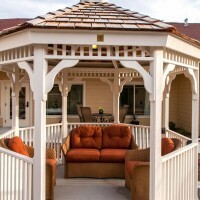 With a meandering path and patio table seating, these scenic spots are perfect for quiet family visits or resident solitary activity, gardening, walks, bird watching, and our horticulture programs. 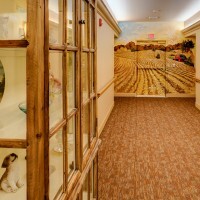 Entering into our residents wings along the atriums, comfortable and welcoming halls are arranged with handsome and homey furnishings and peppered with charming murals. These spaces are designed to create comfort and a sense of the familiar. 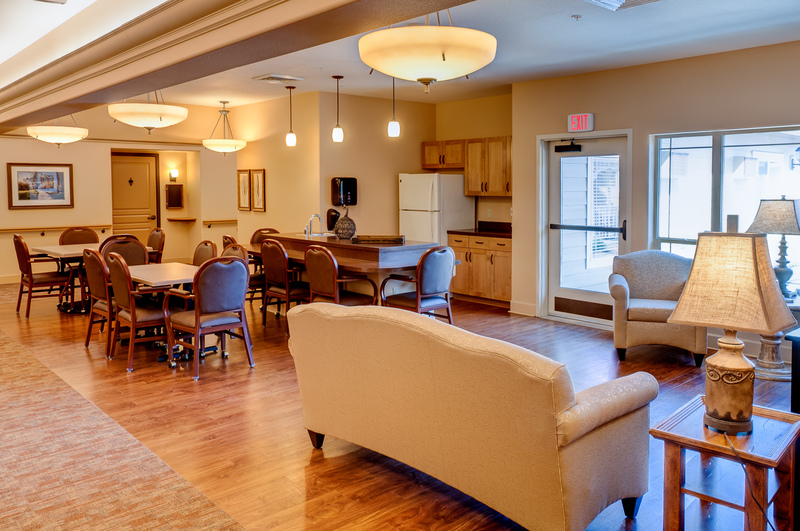 Each wing has its own activities area complete with kitchen and living room, perfect for exercise classes, family meals and visits, and group activities. Further down the hall is a beautifully tiled bathing room, allowing privacy for a warm relaxed bath. 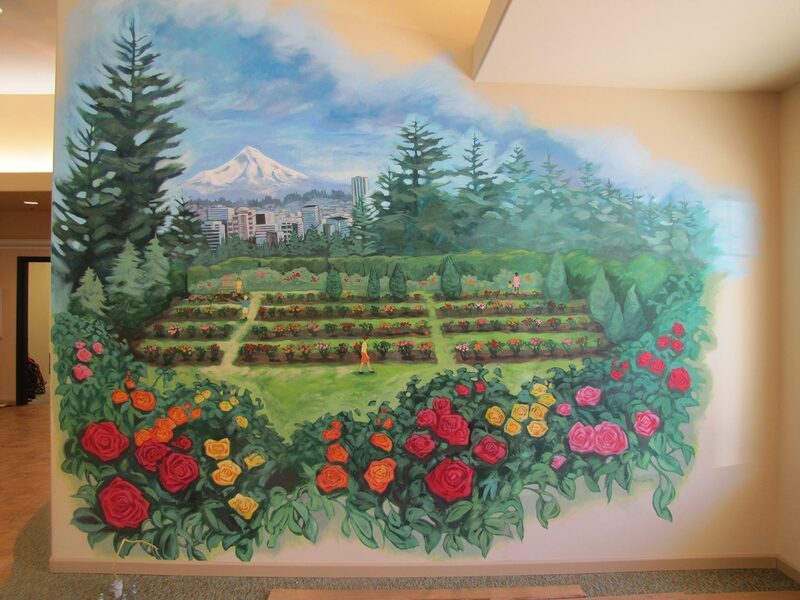 And each resident room welcomes you with a personalized display of the cherished person who resides there. 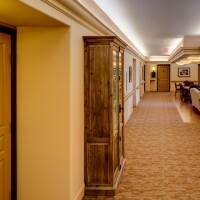 Designing for Memory Care – What is the ‘Why’ Behind the Bedroom Design? This is an excellent question. At first glance the bedroom design might appear underwhelming – and that is exactly the point. 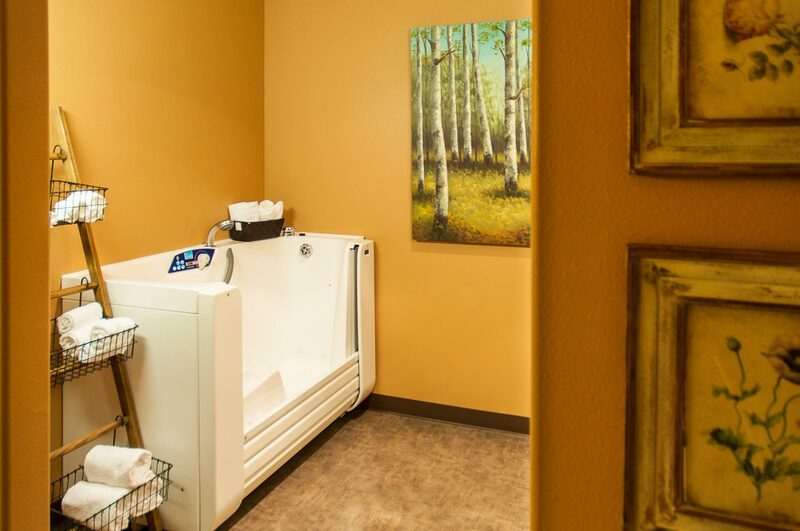 The bedroom design is intended to minimize sensory stimulation and increase safety of movement. 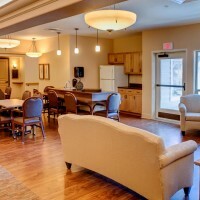 Our residents spend much time in our lovely neighborhood common areas with other residents, staff, guests, and family members. 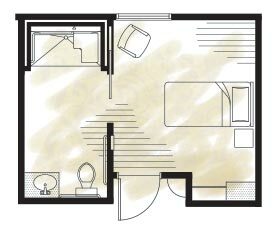 The bedroom offers a contrast to this through soothing colors and reduced sound and light, reminding our residents that it is purpose-specific – that it is for resting and sleeping. And we know that restful sleep is crucial to optimum brain function. The small size also increases safety by decreasing clutter and curtailing obstacles and objects that might contribute to falls. It is designed to hold a bed, a bedside table, a dresser and a chair, though there is enough room for a television if so desired. For a loved one with dementia, this simple small layout can offer a sense of security and calm and lessen environmental stresses – exactly what a bedroom should be. 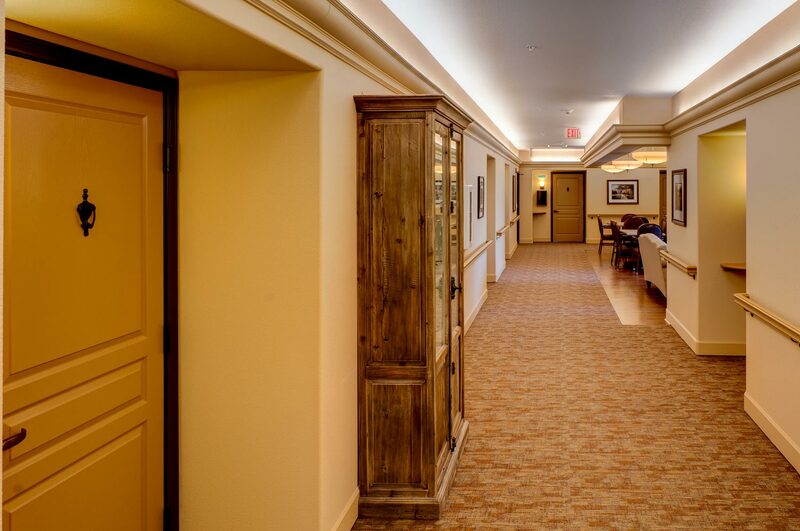 In addition to a continuous innovation of therapies and technologies for enhancing the lives of our residents, what separates Parkview Memory Care is the exacting level of attention to detail. 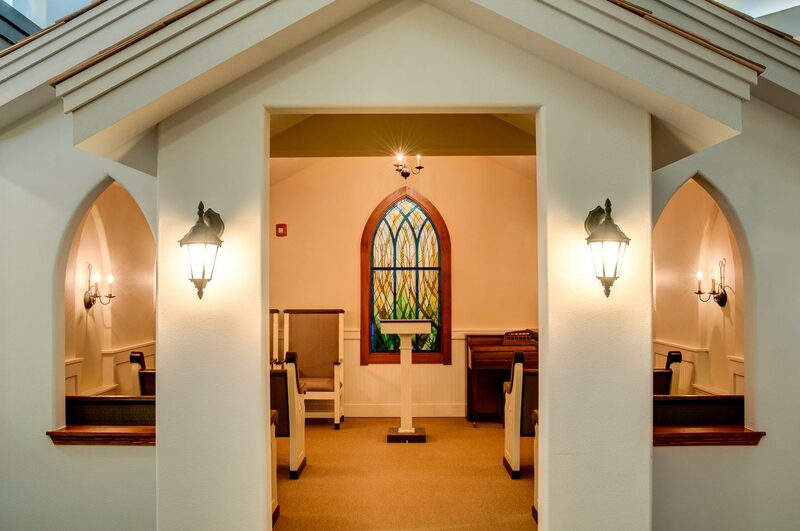 Every space matters and should ignite, invoke, and spark a memory or feeling for our residents. 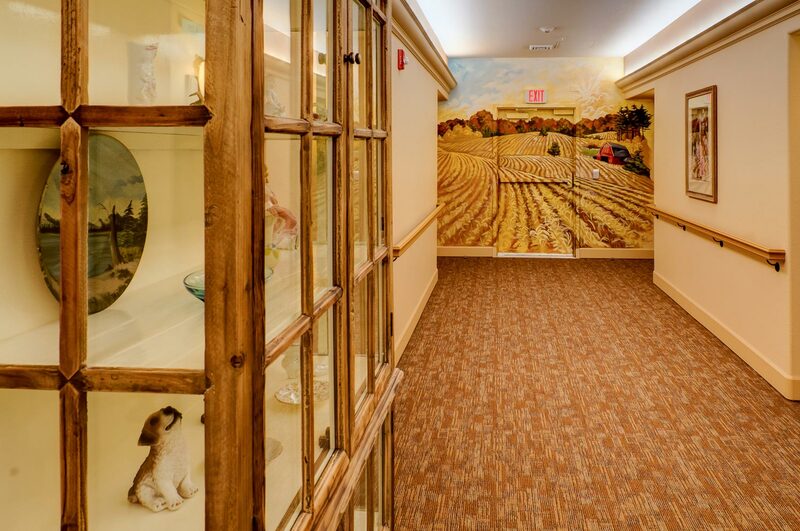 From the antique car parked right inside the building to the colorful charming murals throughout to the intimate dining experience each detail is important, purposefully designed, and can make our residents day. We feel we have the power to make a positive impactful difference in the lives of people experiencing memory loss, behavioral, physical, and cognition changes, and communication limitations that can result from Alzheimer’s and other forms of dementia. 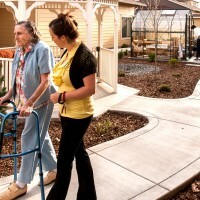 We, at Generations Construction LLC, the design and construction branch of Generations, have made it our duty to design and build memory care communities that are beautiful, richly appointed environments worthy of the precious people who will live there, the families that need to know their loved one can engage and celebrate living even in the face the loss of many aspects of self, and the employees who need tools and spaces of which they can proudly realize our mission. The environment they have created encourages the residents to do things, which I appreciate. I have appreciated the healthy environment they provide. 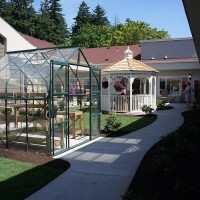 5 stars – Love love love working here….. its the best place to work.. the residents are great and the staff is amazing…. 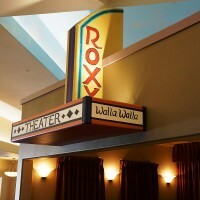 5 stars – I absolutely love working here. 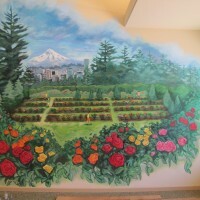 The residents and staff are my second family, and I recommend CherryWood to everyone who is looking for a place to live. It truly is a beautiful, lovely place. I value the time spent with the residents. My mom is in a facility, and it makes me feel like I am with her all the time. It is a rewarding job making the resident’s day. I always value the residents. I know they need us. I value the owner because I respect them. I know they love Paradise. My goal is to give the best as an employee. I always keep in mind to enhance life for the residents. I want to give the best service I can. I think of them like family. 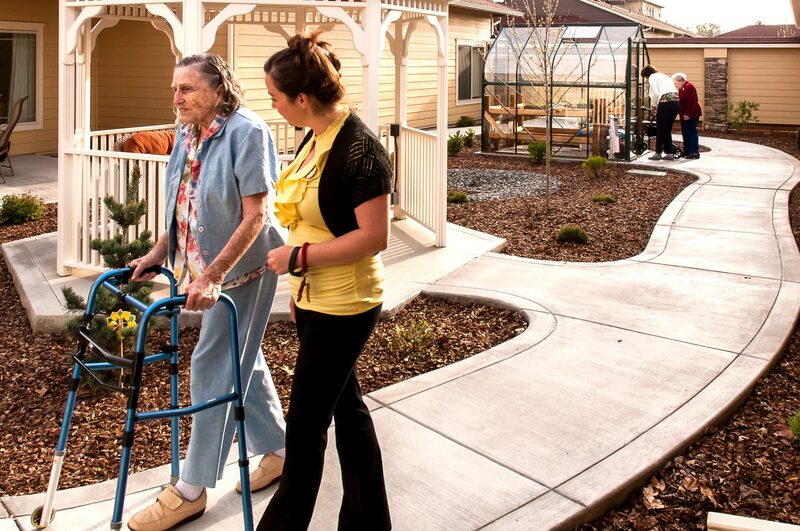 Working at Parkview at Wheatland Village has breathed new life into my career as a nurse! Enhancing Lives and Celebrating the Excitement of Living!